Ever since the "ClimateGate" and "GlacierGate" scandals hit the mainstream media, the science behind global warming and the contribution that human activity has made to it is once again under the spotlight. 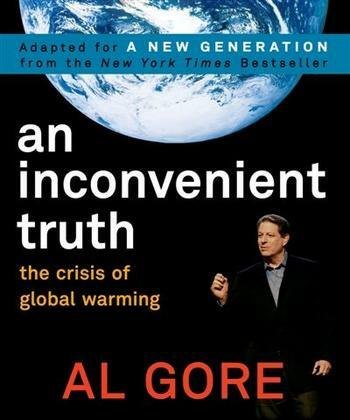 For much of society, Al Gore's "An Inconvenient Truth" marked the final acceptance of the truth behind climate change: the Earth is getting warmer at a catastrophic rate, and humans are the cause of it. Deforestation, carbon emissions, and our lust for oil have been major contributors to rising temperatures - temperatures that will throw the world's climate out of whack. Movies like The Day After Tomorrow (see the trailer, below) played upon this fear of the disaster that we were feeding with our everyday actions. During this time, man-made climate change and global warming were simply accepted as a given. Not any more. 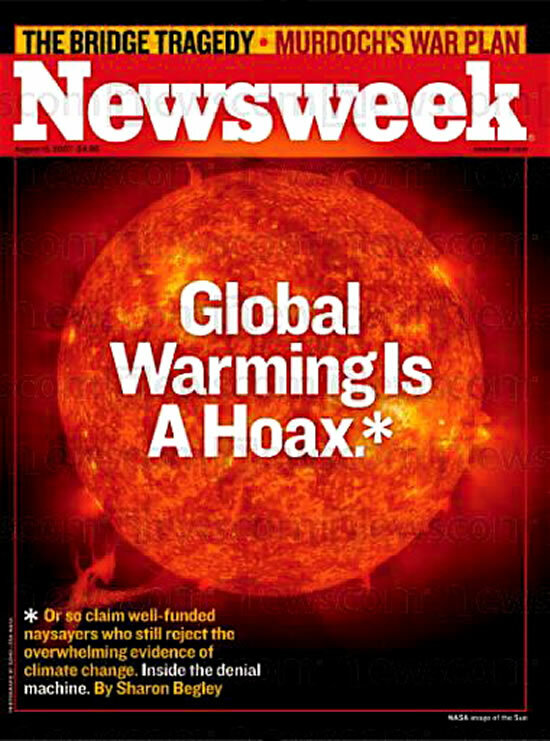 Now, climate change deniers have always existed, as has the conspiracy-theory-esque idea that global warming is a hoax (see this Newsweek article and the cover, right). But this theory (and the "deniers" who are behind it) has always remained on the fringe, a joke, so to speak, to the rest of us. Nothing to worry about. Then "ClimateGate" hit: leaked emails between climate change scientists revealed attempts by some to hide or destroy evidence that contradicted the fact that the Earth was getting warmer. The fact that the majority of the research supported global warming was irrelevant - it was the act of hiding information that fed the fire. Scientists are supposed to be objective, they're not supposed to tamper with the evidence so that it fits their own story. The leaked emails suddenly provided the climate change deniers with ammo - a reason not to be so quick to believe the global warming mantra. Next, "GlacierGate" hit: one of the key pieces of information that helped fuel the urgency to stop global warming turned out to be baseless. The former fact - that the mountaintop glaciers in the Himalayas will be completely melted in 20 years at the current rate of warming - turned out to be a mere guess, without a shred of evidence supporting it. If this statistic - widely-used by the IPCC - is false, what about the other well-known global warming "facts"? Do they come from reputable sources or are they guesses, too? The result of these incidents, and the media coverage that continues to provide details on them, is that people no longer accept the idea of global warming without hesitation. They're questioning it. They're arguing about it. Skepticism is creeping in, if only a little. The very fact that there's even a debate is a huge victory for the deniers. Who knows what's real and what's not. Is it all a hoax after all? Does the environment even need saving? Below are a number of articles that outline the varying thoughts on The Great Global Warming Debate. In "The great global warming collapse", Margaret Wente of The Globe and Mail writes a detailed opinion piece on the science scandals. According to her, "the air has gone out of the climate-change movement", and that it's only a matter of time until the public gets the message about the bad science and stops caring about climate change. Check out the ridiculous amount of reader comments (1279) - evidence that there are a ton of people out there who are passionate about the debate. In "The science isn't settled. Now what? ", Wente comments on the battle between the traditional climate-change deniers and the "true believers" (who are, ironically, also deniers of the unsettled evidence). Again, an enormous amount of public feedback (816 comments). "These days, there are two kinds of deniers – people such as Republicans, who believe it's all a fraud, and true believers, who are in denial that they are witnessing an epic scientific and political train wreck." In "They're finally admitting the science isn't settled", Lorne Gunter of The National Post writes about the "huge" and "wide-ranging" implications of the flawed climate science. "Climategate also matters because if one of the most critical sources of climate data is suspect, then the conclusions in all the scores of studies based on that data are suspect, too." Peter Foster of The National Post writes in "Denial not just for the deniers" that the science behind climate change has been "cooked". "The leftist "moral" stance of many supporters may always have been that the science was merely a facilitator for a Better World. Suspicion of that orientation -- and rejection of its premises -- has led many skeptics to conclude that climate science has been cooked. It increasingly appears they were right." Tyler Hamilton of The Toronto Star writes an argument against the relevancy of the current skepticism, considering the massive amounts of reliable evidence that global warming is indeed happening in "Spin is in, but climate change still there". In "The doubters do disservice to climate facts", Eric Reguly of The Globe and Mail notes the growing public skepticism but argues that the evidence still suggests that climate change is "real and dangerous". "Opinion polls show that public skepticism about man-made climate change has climbed in recent months as the stories questioning the legitimacy of the science migrate from the Internet's fringes to the mainstream media... [but] the preponderance of evidence, to use a civil lawyer's term, suggests climate change is real and dangerous." Achim Steiner of the United Nations environment program defends the integrity of the IPCC and argues that the world can't afford any further delays in addressing the challenges of climate change in "UN climate panel's errors no excuse to put work on ice". "Rather than undermine the IPCC's work, we should renew and redouble our efforts to support its mammoth task in assembling the science and knowledge for its fifth assessment in 2014. What is needed is an urgent international response to the multiple challenges of energy security, air pollution, natural-resource management, and climate change." Finally, Carol Goar of The Toronto Star writes in "Questions for climate change skeptics" that regardless of whether the climate change skepticism is merited or not, reducing our emissions and our dependence on fossil fuels simply makes sense. "Even if all these assumptions turn out to be right: Wouldn't it make sense to set tougher emissions standards for the vehicles that pollute the air we breathe? Wouldn't it make sense to stop burning up and selling off non-renewable resources as if there were no tomorrow? Wouldn't it make sense to reduce our fossil fuel dependence in an energy-scarce world, where oil prices are sure to rise?"